Deer hunting has changed dramatically over the ages. Once a fundamental aspect of primitive man’s survival, it has evolved into a more specialized and technical pursuit, a somewhat more discretionary quest in its contemporary form. Perhaps the biggest example of its transformation is the sporting community’s fixation on killing deer with immense headgear. To the modern deer hunter, generally speaking, size matters. James Kroll has plenty of advice on the subject. Kroll, famously known as “Dr. Deer” in the sporting media, spoke recently at a seminar on deer management put together by John Butler, owner of Arkansas County Seed Co. in Stuttgart, Ark., a leader in the development, production and marketing of seed for whitetail food plots. Kroll is the director of the Institute for White-tailed Deer Research and Management at Stephen F. Austin State University in Texas. He has studied deer intensively for the better part of four decades. Think like a deer – Deer are creatures of habit, and remembering the first tip about a deer’s survival instincts, don’t forget that a buck’s elusive nature means he’s rarely going to give himself away to hunters. Ask yourself this: If I was a deer and wanted to get from here to there without anybody seeing me, where would I go? Rubs mean more than scrapes – Concentrate less on scrapes and more on rubs. “You’ll do a lot better if you go out as soon as you can and get an aerial photo of your hunting area,” he said. “Then go out and find the rubs and start mapping them. Connect the dots, and you’ll find out where the bucks are going to be.” Kroll cites an example of a high-fenced area in Michigan, where all the deer were removed from the large enclosure. When deer were restocked to the area, the new deer almost exclusively frequented the same rub lines that had been established by the deer that had been removed. Let the bucks get older – While deer hunters and deer biologists still debate the merits of culling so-called inferior bucks, Kroll cautions against a culling campaign. “Walk away from this culling stuff,” Kroll said. “Give ‘em good groceries and let ‘em grow up.” Kroll argues that genetics are largely beyond the hunter’s control, and that individual animals develop at different paces. Just as the runt of the kindergarten class may turn out to be the high school linebacker, so may a yearling spike turn out to be a 4 ½- or 5 ½-year-old buck with a monster rack. More importantly, decades of Kroll’s research backs up his assertion. Manage existing habitat – Supplemental nutrition is important (and we’ll deal with that in just a minute), but start your habitat management plan by improving natural forage as the system’s base. 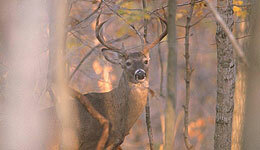 Thin the forest and allow sunlight to hit the ground and help generate a natural forage base. Prescribed fire is another important tool. It removed undesirable undergrowth and stimulates the regeneration of good vegetation that benefits deer and other wildlife. The best news for hunters and land managers is that both of these habitat-improvement methods are relatively inexpensive. Provide supplemental nutrition with food plots – “I’ve never been anywhere where the nutrition was perfect,” Kroll said, noting that a one-acre food plot can provide the same amount of nutrition for whitetails as 100 acres of forested habitat. Take a measured approach by getting soil tests and then applying base lime and fertilizers as recommended by agriculture extension agents. Kroll’s suggestion for good whitetail food plots is to use a combination of cereal grains and legumes. He prefers cold-hardy forage oats, clovers and chicory. He recommends planting the oats at a rate of 100 pounds per acre and then top-sowing either chicory or clover. By mixing the crops, hunters offer whitetails different foods that contain different nutritional values to serve the deer’s needs. Establish a long-term plan – Kroll advocates a management system that relies on habitat management, supplemental nutrition, record keeping, herd management and people management. The goals of his “Dr. Deer Management System” include increasing recruitment (the number of deer that will be born and survive to adulthood), improving nutrition, increasing the buck age structure (more older bucks), decreasing the doe age structure (fewer older does) and increasing antler quality.